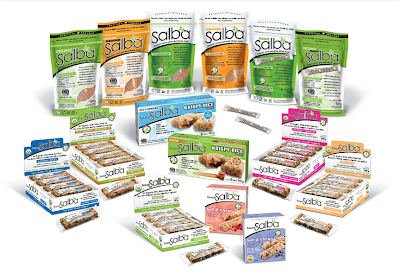 eat, drink & be vegan: Source Salba Giveaway! ...a value of $40! All you need to do is correctly answer two questions about Salba seed, and then post the answer (with your name or blogger profile) in the comments of this post. I will then randomly choose a winner from the comments posted - one entry per person; open to Canadian residents only. (sorry my lovely readers outside of Canada) The winner will be notified on this blog at the beginning of October and we will then arrange to have the prize mailed to you. Please link through for the full contest rules. 1) How can Salba be used as egg replacer in baking recipes? 2) How much of your daily requirement of omega-3 (alpha-linolenic acid) do two tablespoons of Salba provide? Here's the best part about this contest... you have a chance to win this month (Sept), and we will repeat the contest for October, November, and December! Good luck... go search for the answers! I would love to try salba, but I am not Canadian. Oh well, sometimes the grass really IS greener on the other side of the fence! So, 1) Salba can replace one egg by mixing 2 tablespoons Salba with half a cup of cold water. It will form 1/4 cup gel that is used to replace the egg in baking. And 2) Each 2 tablespoons of salba provides over 2400mg of omgega-3. Fantastic blog, books, recipes, writing. Thanks! I found the same info as Chris: 2 tbsp of ground Salba plus 1/2 cup of cold water is equivalent to one egg. Also, 2 tbsps of Salba contains 2400 mg of Omega-3. 1) Mix 2 tbsp of salba with a half cup of cold water to replace one egg in baked goods. 2) 2 tbsp of salba contains 2400mg of omega-3 fatty acids. I will keep my fingers crossed. Thanks for bringing us this opportunity Dreena! I've been wanting to try Salba for a while now. Awesome contest! Ooh, I wish I was Canadian! I'm very lucky: Salba® is sold practically around the corner from where I live. I use the ground Salba® but have yet to try all the other products in the giveaway. Thanks for this chance to win a great food assortment! 1) Mix 2Tbsp Salba with 1/2 a cup of cold water, but use 1/4 cup of the mixture to equal 1 egg. I'm new to the vegan world (trying to incorporate vegan and vegetarian recipes and lifestyles into our regular diet/life) and love your site...unfortunately I had to look up the answers...but here they are anyway. Clearly my answer must be right so now I hope I win the draw! 2.) 2 TBSP of salba seed contains 5000 mg of omega 3. When I looked up what the RDI for omega 3 was I was suprised there isn't one established yet! But I did find that Salba's ratio of Omega 3/6 is 3:1 which is great. 1- grind two TBSP salba & mix with .5 cups cold water for each egg sub. For the first question, mix two tablespoons of Salba with half a cup of cold water as an egg-replacer (one egg). For the second, two tablespoons of Salba containeds 2,400 mg Omega-3. You know I'm a Canuck. I see bags of Salba at the Bulk Barn, but have never tried one. I didn't know they made bars and things. Awesome! 1- 2 tbsp of ground Salba plus 1/2cup of cold water is equivalent to one egg. 2- 2 tbsps of Salba contains 2400 mg of Omega-3. Oooh I love Salba - but as I write about it all the time and purchase it on a regular basis, I will opt out of entering so perhaps someone who has never tried the amazing seed can try it and benefit! September is Salba month on Evolving Wellness! 1 tbsp Salba plus 3 tblsp of salba stirred until viscous can replace an egg. (1) Mix 1/2 a cup of water with three tablespoons of Salba. Stir until thick. This will replace replace one egg. (2) Two tablespoons provide more than 100% of your daily recommended intake of omega 3 fatty acids. It provides 2400mg. 1) By mixing 2 Tbsp. ground Salba with 1/2 cup water to make Salba gel, and using 1/4 cup of Salba gel per egg in the recipe. 2) More than 100%, according to the DRI system. Ah ha! I hope I'm not too late! Each 2 tablespoons of salba provides over 2400mg of omgega-3. I've never tried salba but have heard great things about it so would love to try some samples. Answer 1: Salba can replace one egg by mixing 2 tablespoons Salba with half a cup of cold water. It will form 1/4 cup gel that is used to replace the egg in baking. Answer 2: Each 2 tablespoons of salba provides over 2400mg of omgega-3. if only i was canadian!!! !